Indiana Jones (Harrison Ford) and I have something in common. We both hate snakes. My fear is inherited. My grandfather died when my mom was ten after stepping on a snake while walking home thru a dark field in his village in India. Needless to say when we visit this still rustic, rural hamlet we take LARGE flashlights. Having grown up scared of snakes I’ve made sure I know what to do in the event of a snake bite. Do you? Sounds like most westerns have the wrong idea. So what can you do to treat a snake bite? 7. Try to make note of what the snake looks like. This can help emergency personnel determine if the snake is poisonous or not. At the hospital doctors will decide if antivenom is needed (based on what type of snake bit the victim) and what wound care is needed. All snake bites need medical attention (anything from local wound care to surgery) and a tetanus booster. Snake bites are fairly rare. 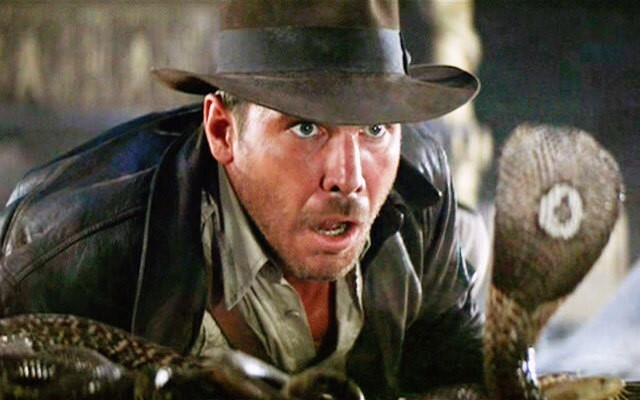 Maybe Indiana should have listened to his dad, Dr. Henry Jones Sr. (Sean Connery), and been afraid of rats. Now those things help spread disease!